Rachel’s is open for breakfast (on weekends), lunch and dinner and has become a great hangout for folks wanting a homecooked meal in Steinhatchee. I’ve listed it in the Fishing and Boating category because one of their specialties is ‘guest fish’–not that the fish are ‘guests’, but that they’ll happily cook your catch for lunch or dinner. Larry and Leianne Carnes, the owners (and cooks and bottle-washers), say that most folks who used to want their fish fried are now asking for it to be blackened. Redfish, grouper and snapper all ‘blacken’ well. The next time you catch a bunch of fish at Steinhatchee, clean them up and bring them to Rachel’s and enjoy them for lunch or dinner. Rachel’s is located at the north end of the 10th Street bridge. 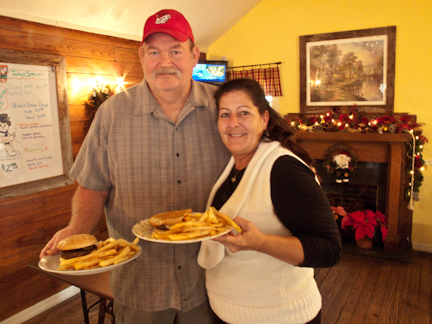 Larry and Leianne with one of their famous half-pound burgers and a patty melt sandwich. Just two choices from their broad menu. In addition to fish, Rachel’s also serves full breakfasts (on weekends in Winter months) and some great lunchtime sandwiches. There’s also a daily lunch and dinner special. Recently, they featured fried quail, and according to Larry, the most popular dinner entree is his chicken-fried steak. In addition to all of the above, Rachel’s serves an All-You-Can-Eat Fried Shrimp dinner on Friday nights for only $19.95. 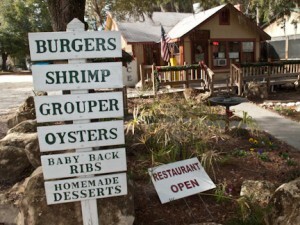 And the best news is that the shrimp served at Rachel’s are GULF SHRIMP!